NEW FOR 2009 Our Flip-Flop box which will empower anglers to have their favorite tackle at their fingertips while wading. 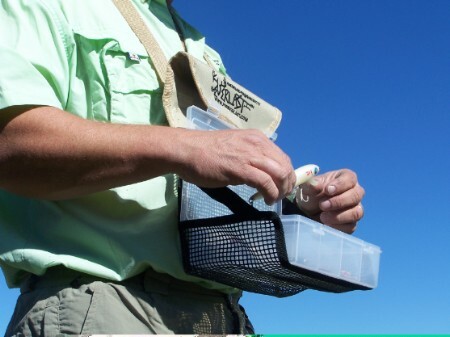 This unique design provides the maneuverability to change out top water lures, soft plastic baits, or whatever the angler desires to carry in the large 4 compartment box with its patented flip down pouch you won't have to remove the box in order to do so. The shoulder strap is fully adjustable and features a non slip shoulder pad so that the total system will stay exactly where you want it to be.